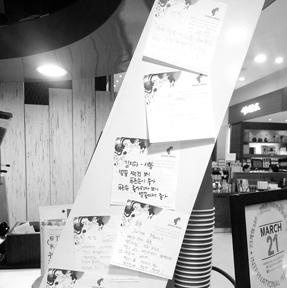 Poetry became the new currency in coffee outlets around the world on March 21 as the World Poetry Day campaign spread to 34 countries. Initiated by an Austrian coffee roasting company Julius Meinl, which offered a shot of caffeine to customers who handed in a poem, to mark World Poetry Day in 2015, the move gathered momentum, with the idea being turned into a campaign this year. The initial offer in 2015 had seen more than 100,000 people in 23 countries gobbling up the offer according to coffee company Julius Meinl. This year, the firm expanded it to 1,280 coffee outlets in 34 countries, mostly in central and eastern Europe, but also including locations in London, Edinburgh, the US, Canada and Australia. Poet and conceptual artist Robert Montgomery mark the occasion by collecting up all the public contributions and turning them into an art installation in a secret London location. The 'Pay with Poem' campaigns is being seen as the perfect antidote to all pesky and portentous coffee connected issues including rising prices and the extreme hipsterisation of coffee making it a symbol of gentrification? Any takers in Sri Lanka?